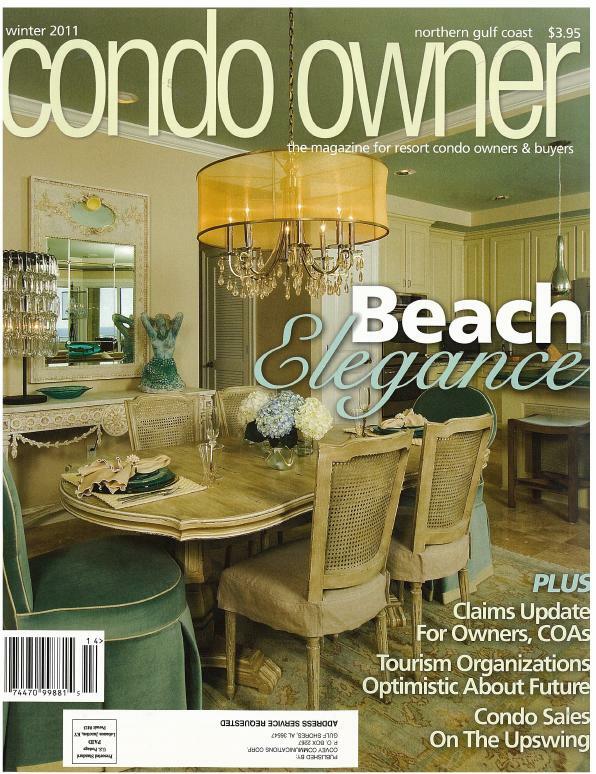 This is a project that I am currently working on in Regency Towers in Destin, Florida. I will add more pictures to this post as the project moves closer to its finish date. The style is a mix of classic traditional with contemporary. 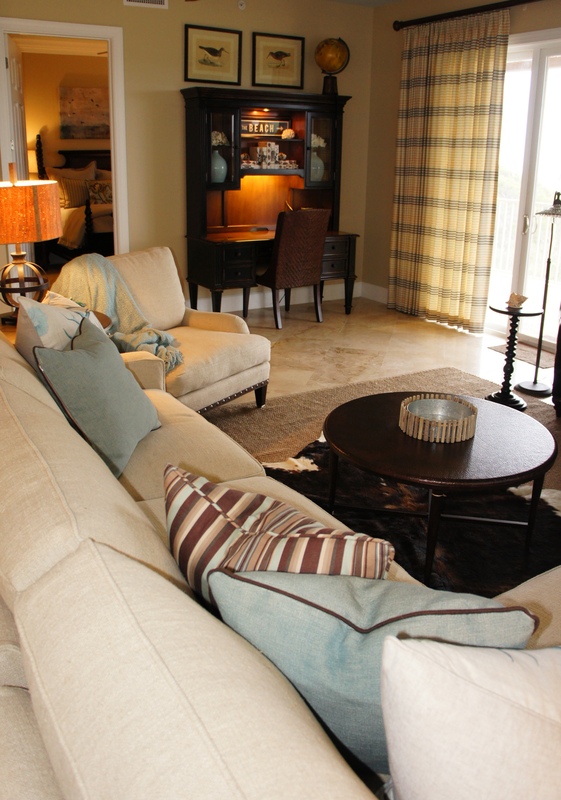 Throughout the condo, I repeated the colors blue, green, brown, and splashes of green for an organic accent. 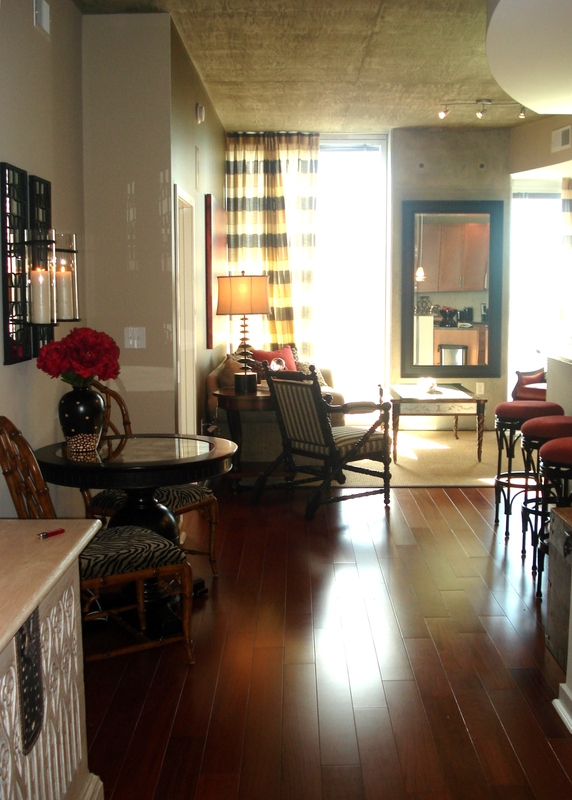 The entire condominium was recently updated to make it more current and appealing. Walls were knocked down and replaced with a floating kitchen island/bar. Openings were cut into the main hallway to give more access to the Dining/Living Room, and to add an opening for a wet bar. Custom wood paneling, trim, built-in bookshelves and cabinets were added to the main living areas for storage, grandeur and warmth. The kitchen cabinets are also all custom. They mix off-white shaker-style doors with natural wood panel doors for a layering of color and texture. Granite countertops, travertine backsplash and Viking Appliances go the extra mile in making the space top-of-the-line. 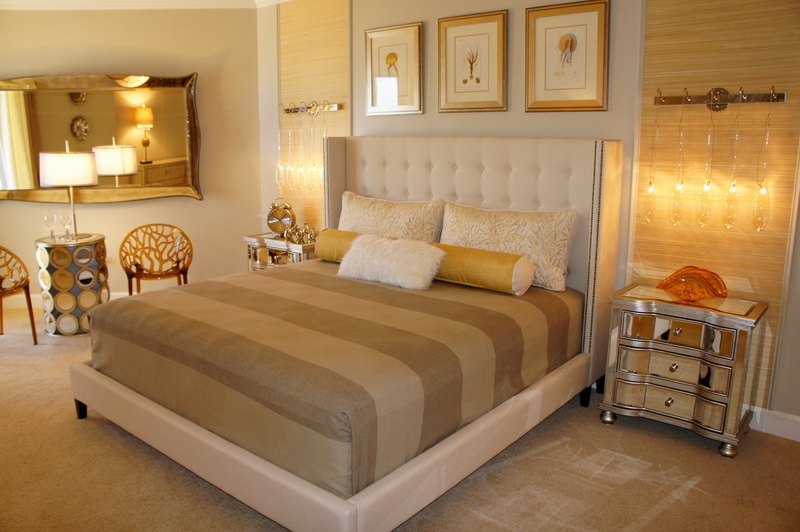 Master Bedroom: This room features a Lane Furniture sleigh/platform bed, and RDI mirrored nightstands. The Arteriors swing-arm lamps free up space on the nightstands and provide versatile lighting options. The bench at the foot of the bed provides a place to sit, and a place to fold down the pillows and covers at night. 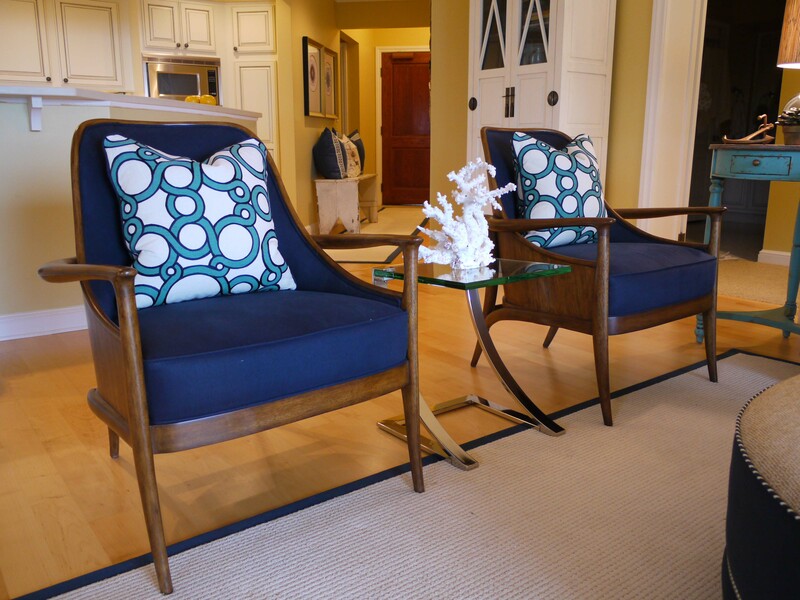 By the window is a Lexington Furniture swivel chair-and-a-half. This is the perfect spot to cuddle with a partner, or curl up and read a book. The swivel allows the owner to switch their focus between the view of the beach, the television and the main part of the room. 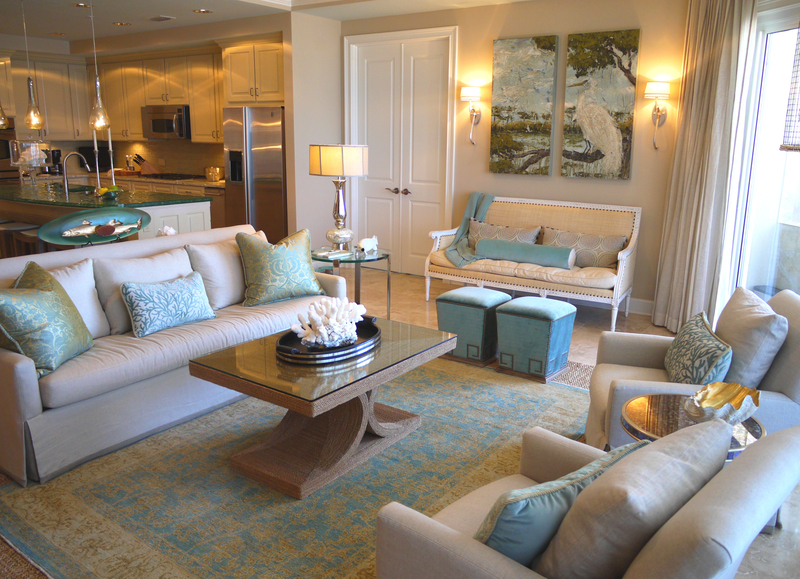 Soothing blues and earthy greens make this room the light, coastal escape they wanted. Children’s Room: This room was designed to be fun and whimsical. Two queen beds were placed on the main wall, then accented with an orange drum table and an antique mirror round bedside table. The red Barcelona chair pulls out the red flowers in the Euro pillows, and add a touch of modern. The red bunk bed pulls red to the other side of the room. I made two long striped “body bolsters” that tie in all the colors. These are great to cuddle with at night, but they also provide a back pillow so that the kids can sit an play video games and treat the bunk bed as daybeds. 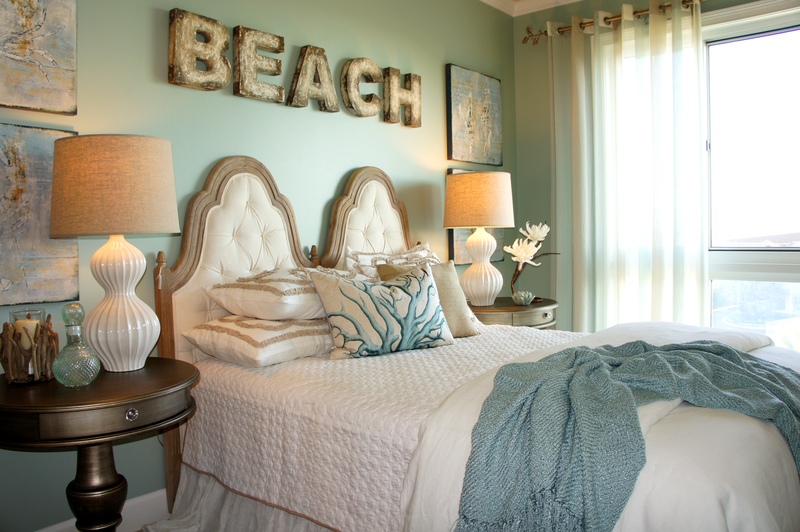 Baskets add storage for clothes and shoes, and the hand-sewn starfish pillows add a touch of whimsy. The Elevator Vestibule/Lobby, which accesses two condominiums, was in dire need of updating. I did this by adding trim work, wainscoting, new lighting, new furniture and window treatments. I designed the trimwork so that all the doors had headers for height and more architectural interest. We widened all the door moldings and added mitered wood pieces to the doors and below the chairrail for a paneled-look. Then, I painted everything below the chairrail white to create wainscoting. I painted the walls a dark chocolate brown to accentuate all the new woodwork. 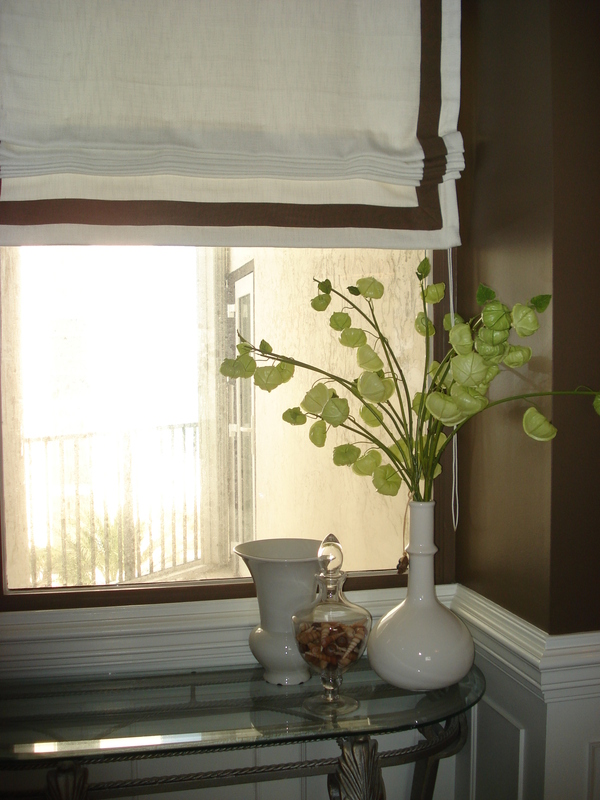 I designed contemporary fabric roman shades that are the color of the trim. The band of brown that matches the walls help to make the windows a focal point. 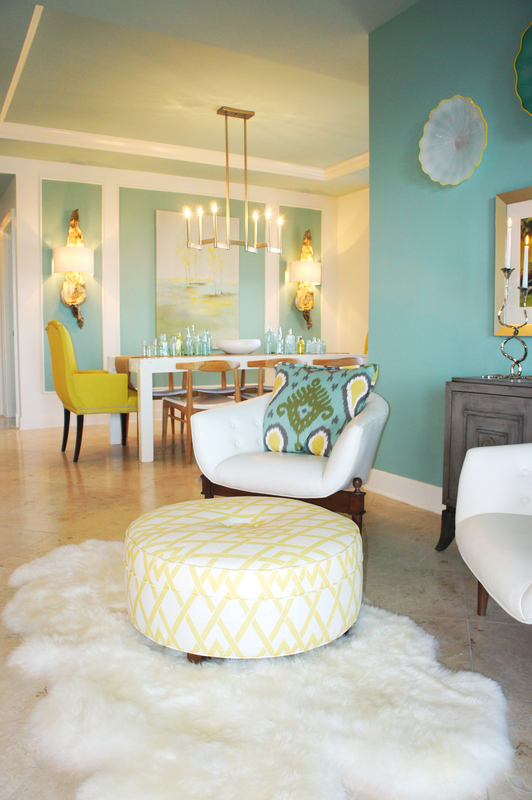 A new center chandelier and new sconces finish off the look and the atmosphere. Silver/bronze chainlink drum chandeliers replaced flush-mount fluorescent fixtures in the Elevator Vestibule for a more intimate, residential atmosphere. 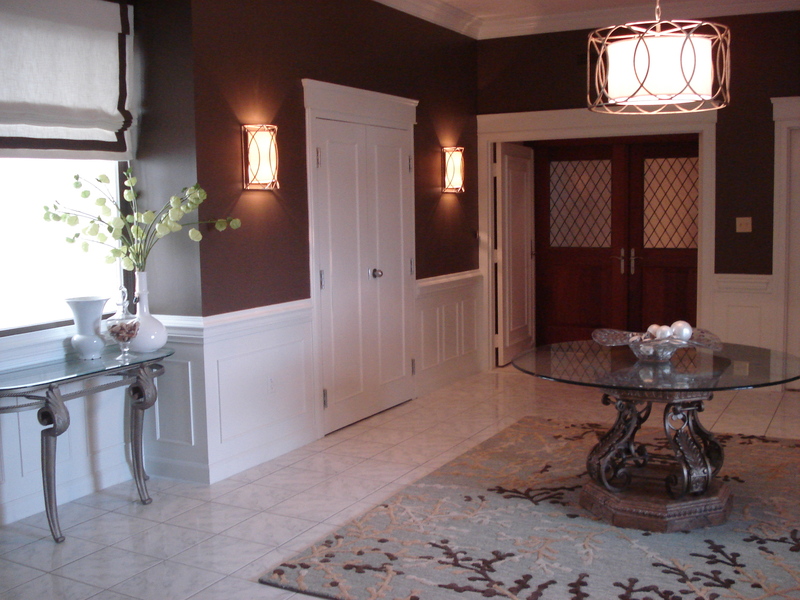 The embossed leather hall chest stands out nicely against the white wainscoting. The other side of the vestibule has a leather tufted bench. your blog is looking great…also on page one of Google…you go!